Thank you for joining us for this first year with Lisette! To celebrate our first holiday season, we’ve made you a little gift. This swatch card set will help you to organize your fabrics. 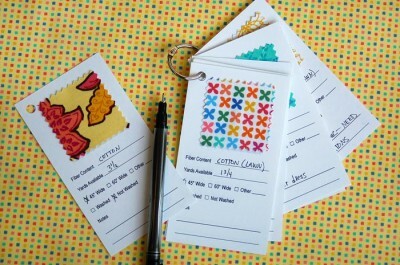 Print out as many as you like, and attach a swatch in the indicated spots to help you remember what fabric you own, how much of it, and to help with matching buttons or thread. You can either cut out the cards and attach them with a ring or put them in a 3-ring binder and take it along when you shop. You can download the free PDF file from our website. Either way you use them, we hope 2011 has been a great year for you, and we look forward to sewing with you more in 2012. Awesome! This is perfect for using my stash and buying new fabric for a project! Oh, how very handy this will be… Thanks! Thanks!! Maybe these will help me get my stash organized. I love this. I will use them in the binder like you have, and on a ring. This is such an awesome idea. I do not know what fabric I have, but after this I will. Thank you. You are awesome and inspiring and I look forward to the new year with Lisette and Oliver & S and all of your beautiful fabrics to make me and my family feel and look awesome. Thanks again. Thank you so much! I was going to try to design something for keeping track of my fabric stash. This is absolutely fantastic and just made my life much easier!!!! Thank you again! What a great idea! I was just looking at my stash and thinking I needed to organize it over the christmas holidays…you’ve just made it infinitely easier! 🙂 Merry Christmas! You are out of this world brilliant! This will help with matching and grouping and sorting out what to use with what pattern – everything! Thankyou so much! It’s genius! Wow! Perfect, thank you so much. Wow, this is a fantastic share!! I love this idea, and makes shopping for final project embellishments a breeze. Thank you so much! These are both cute and so useful! 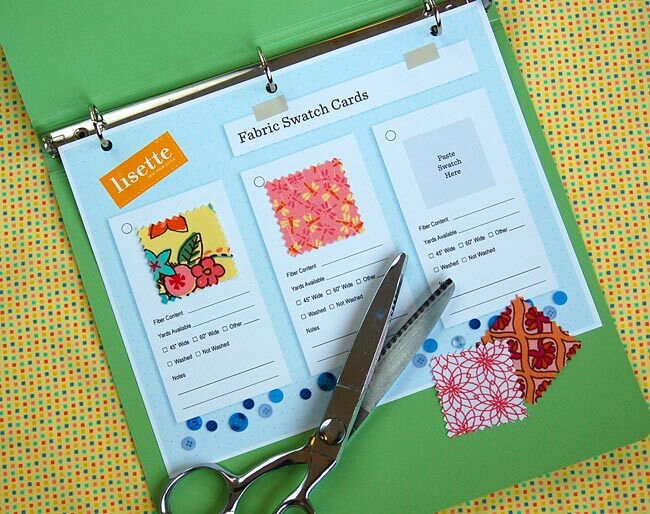 I secretly hope this is also a peek at the next Lisette fabric collection…..ACK! So much cute. Karen, the swatches are indeed our next collection, which is on its way to Jo-Ann stores as we speak! Glad you like it. That’s a wonderful idea to keep organized! Thanks. Nice idea. Thanks. Happy Holidays. I like this idea when trying to match up something. Usually I find me taking back the whole piece just to buy coordinates. You are now my best friends!!! This is great! Thanks! Thank you for the sweet gift and best wishes to you in the coming year! Thank you so very much for this little Christmas gift. Well, I’m on the website because I’ve already purchased my 1st piece of fabric from the new collection at Joanne’s on Monday. I was hoping to see new patterns and more fabric choices on the site!?!?! Tell me what you know fans!!! GREAT COLORS!!!! You’ll be excited too! Yes, the spring fabric collection has just started arriving in stores. We’ll have information about it here next week once it has had a chance to make it onto shelves across the country. And the spring patterns will be available in February.